As a carer, what home supports do I really want? It’s been 12 days since the boys and I moved into our forever home. (I repeat that line in my head because I still can’t believe it). I haven’t written an updated blog piece since. You can guess why. Yesterday was the first day that there hasn’t been someone calling to the house for either Brendan’s services being set up or for household services being set up. I’m exhausted, but it’s a happy exhausted. Yesterday I had great intentions of completing all the paperwork, applications, and emails waiting for me while also cleaning and sorting out the sitting room and kitchen. None of that got done. I watched Netflix instead. I do feel slightly guilty, but today I’ve been up since 7am and haven’t stopped moving until now (midday). I guess I needed that rest. Ok, I know I needed that rest. One of the meetings I had this week here at the house was with a member of Brendan Bjorn’s new disability team here in Co. Wexford. They seem great, may I just add. The conversation about home help came up, and rightly so. In the week since that meeting, I have been thinking long and hard about what I really want…and don’t want. First of all, readers need to understand that what I want and/or need can be and likely is somehow different than any other full time carer. We all have unique situations. Home supports, therefore, should all be tailored to meet those unique, individual needs. Back to the meeting last week. The discussion of in home nursing help arose. Do I need it? Do I want it? My initial reaction was an immediate yes, but that quickly changed as I was made aware that Co. Wexford is following the terrible Loco Parentis clause where the parent is not allowed to leave the home when a nurse is in to provide respite. In other words, the parent is to take respite in the home. THAT IS NOT RESPITE. NOT AT ALL. What that is – in my opinion – is inhumane to the carer. Just think of it this way: A nurse works a 24 hour shift 7 days a week with no sight of any time off. She does get to sleep at night, but is on call during those hours and undoubtedly is beckoned back to work at least once during the night at least half of the time. Enter time off: The nurse can get 5 hours break each week, but the catch is that the nurse may not leave the hospital. She must take her break there while another nurse tends to her patient. She is not allowed to go meet friends for a coffee, to run errands in town, or even to take a casual stroll in the local parklands to clear her head for those 5 hours. No, the nurse must remain in the hospital (the hospital she is in 24/7, remember) just in case her patient has an emergency that she, instead of the relief nurse, must tend to. That, dear readers, is Loco Parentis. And for parents like me who are lone parents, no family or friends to step in with respite help, and a child who is again bedridden leaving me housebound, that makes Loco Parentis inhumane. If the above description of the nurse was the reality, you can rest assured it would never, ever be allowed to happen. Unions would never allow it. The public would be in an uproar in support. But no, we are *just* carers. We have no union. The public don’t walk in our shoes so can’t completely understand. Maybe the nurse analogy will help? I want to be able to have at least 5 hours a week, free to go wherever I want or need to go. Alone. Without my son whom I love more than life itself. There is an amount of guilt that comes with saying I want to have time without him. Trust me. Yet I also know that for me to be all I should be for him, I need that time to recharge, to unwind, to remember who I am as Tracy. I don’t need help dressing him or changing him or doing his medications. I don’t need help giving him a bed bath. Now once the housing adaptations have been made and there is a wet room where his shower trolley can be used, I wouldn’t mind help hoisting him to and from for a shower. Otherwise, I don’t need help caring for him while I am here. I need help being able to leave for a respite break. Loco Parentis must be axed immediately. 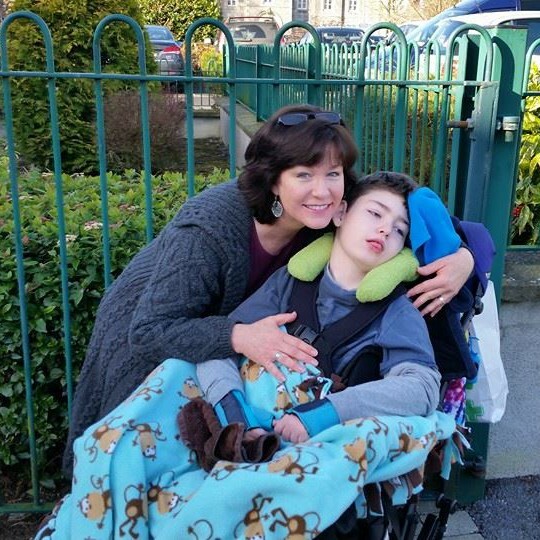 Respite must be made available for families like mine but tailored to suit their unique needs. The Dept of Social Protection and the HSE need to review their policies regarding when a family like mine moves from one county to another: Carers have enough to do without being made to reapply for your disabled child’s Long Term Illness card, reapplying for Household Benefits, and having to call into the local Intreo office to provide proof of the new address because we can’t simply email that proof in (and as is clear from this blog piece, I can’t call into their office). 12 days since the boys and I have moved into our forever home. We are blessed beyond belief to have a home. But to be sure, I will continue advocating for positive reforms for carers and our children with life-limiting illness and disability. Tomorrow is another day and I will then pick up my sword to continue the battle. For now, there are more boxes waiting to be unpacked and a beautiful boy down the hallway who wants some kisses.